From my earliest memories, the noise of a sports car has excited me and driven my passion for driving. Sadly for us petrolheads, noise pollution has become a hot topic. For this reason, UK circuits operate strict noise management policies, which vary by circuit and often by day. If you are planning your first track day or trying out a new circuit, one of your first considerations should be how loud your car is. Here at CAT Driver Training, we have attended more track days than we can count. When booking the day, one of the most common questions our customers ask is, what is this static noise test I keep hearing about and do I need to worry about it? The answer, in short, is maybe. However, there are some key facts you need to be aware of to make sure you have no issues on the day. This guide will help to clear up any confusion, you can then focus on what really matters – enjoying your car on track! Make sure you also check out our interactive map, which lists the noise limits for all UK tracks. Read through this guide at your leisure or skip to one of the sections below. How is car noise measured? Is my car likely to exceed the noise limits? All race tracks have to adhere to their local council’s environmental noise policy. Failure to manage noise levels can lead to complaints by residents, fines and even the threat of closure. Councils work together with the track team and locals to strike a balance everyone is happy with. Tracks are required to record daily noise levels and report the cause of any anomalies. Some councils access a real-time feed, tracking drive-by decibel readings. The reason for Silencing (SOUND CONTROL) is to reduce environmental impact and to keep Motor Sport running. Environmental Protection legislation has increased the pressure on activities generating noise and Local Authorities have the power to suppress any noise source deemed to be causing a nuisance. 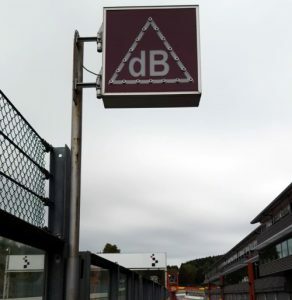 Vehicle noise levels are measured using dB(A), a decibel reading that has been weighted to take into account the perceived loudness of a sound. The measurement is taken using a Decibel Meter, a gadget you can buy easily online to get an idea of what ballpark your car’s dB(A) reading is. There is also a range of decibel meter smartphone apps, however, despite perhaps giving you an indication, you can’t rely on these readings 100% as track day readings will be impacted by various factors; surroundings, air pressure, air moisture and temperature can all affect what measurement is read. To avoid disappointment, we recommend speaking with your track day organiser or even the circuit to seek advice based on your vehicle set-up. Some tracks will give you a free test prior to the track day. Many track day organisers such as Motorsport Vision will give you a compulsory static test reading before you are allowed on track. This test usually follows the standard set by Motorsport UK guidelines. 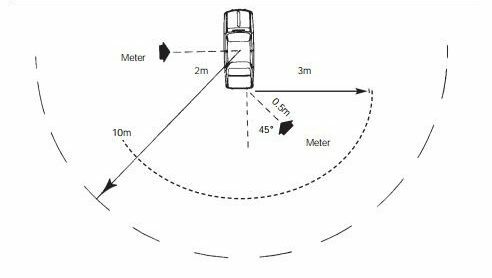 A sound meter will be placed half a metre away from your car’s exhaust at a 45-degree angle, whilst your engine is running at three-quarters of your maximum revs. As well as the Static Test, 11 out of the 19 UK tracks we have included in this guide also operate drive-by noise limits. Additional meters are positioned at various locations around the circuit to monitor noise levels at braking and acceleration points. It is worth noting that with varying drive by’s around the country, readings may be measured from different distances on each circuit, which is why you may notice a variation in the max levels permitted at different venues on our map below. If your reading exceeds the decibel limit set by the circuit (see decibel limits for each circuit below) for either the static or drive-by tests, your car will fail. In the event of a fail some circuits will offer to help you out, however, in many cases, your car will not be allowed on track. My Caterham R400 often tipped the balance at 108dB; there is nothing more annoying than being black flagged before the warm up lap with nothing more than a £150 credit card slip to show for the day! The majority of road cars using their original exhaust system will have no problem passing the noise test. However, some vehicles modified for high-performance may need to plan ahead before arriving to track. Silverstone track days generally have a higher level of 105dB as their policy. Track day organisers Gold Track, a frequent user of Silverstone, offer a higher proportion of days here. There are noisy days at other circuits, but these can be limited in number. If your performance car has a button or menu to change exhaust settings, select the quietest one. Turn off your sport mode if it is linked to a noisier exhaust valve. Fit an additional exhaust silencer prior to your track day. There is a good range to choose from at Demon Tweeks, including their Decibel Slayer , designed with track day users in mind. Please note that there is no guarantee any of these options will reduce your car noise enough to pass the decibel tests. The safest bet is always to check with your track day organiser in advance of your day. We have created a map of all the main UK circuits that host Track Days. If you hover over the icons you will see the Static and Drive-by (where relevant) decibel limits for each track. If you think we have missed any circuits off, please let us know and we will update the map. Please note the limits provided in this map are for Track Days only, many circuits operate different limits for race days. Are you ready to take your track days to the next level? Take a look at our 1 to 1 track day courses for performance driving and over-grip limit handling or get in touch with our team to chat through your objectives on 01234 757 633.